An Integrated course in Electrical Engineering with about 15000 objective type Questions & Answers. This book is helpful for GATE, ESE, PSUs and other similar level competitive Exams. This is a must-have book for all Electrical Engg. aspirant. 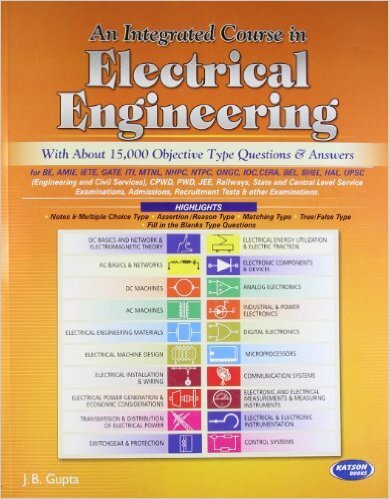 Electrical engineering objective questions for competitive exams PDF download. Download eBook of MCQ by J B Gupta [EE]. This book is copyright of KATSON publication. Your Like and Share motivate us to post more useful ebooks. So, Please Like & Share it. bittu.ee07@gmail.com please mail me bro.. Please Check Facebook Comment of This Post. Link is shared by someone.